What do financial market participants think of the 2016 presidential election? It would be helpful to know in advance of voting. 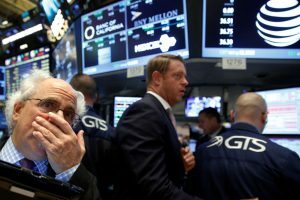 U.K. markets dropped sharply after the Brexit vote, surprising some and leading many “Leave” voters to express some immediate regret. In a recent working paper, Justin Wolfers and I examined how financial markets have reacted to recent ups and downs in the Clinton versus Trump contest. We found that markets expect stock prices to be at least 10 percent higher under a President Hillary Clinton — in the U.S. and globally. Markets also expect higher energy prices under Clinton and stronger currencies for trading partners such as Mexico and Canada. 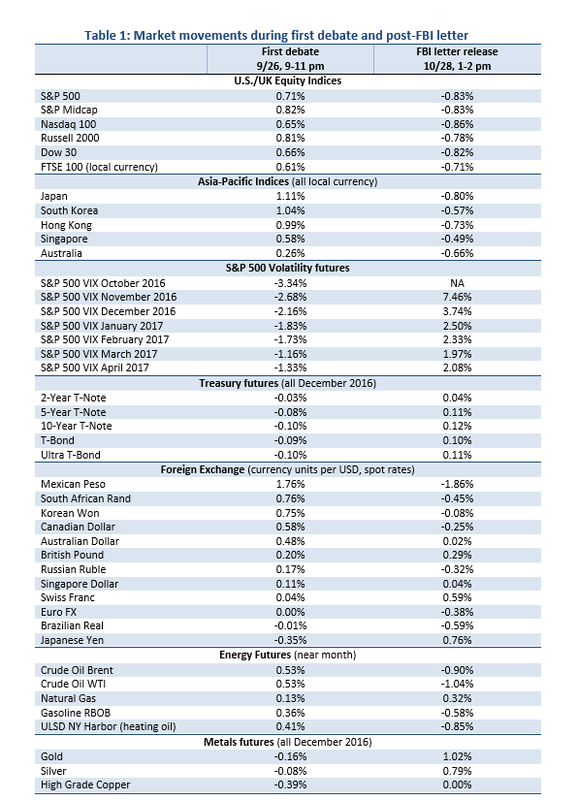 Under a President Donald Trump, markets expect higher volatility and higher prices for safe haven assets such as Treasuries, precious metals and the Japanese yen. The results suggest that market participants expect a stronger economy under Clinton and more risk under Trump. Taken together, the results suggest that market participants expect a stronger economy under Clinton and more risk under Trump. We are able to isolate these expectations by examining market movements during short time periods when political events shifted the candidates’ odds of winning sharply. In our paper, which was released on Oct. 21, we analyze the two biggest shocks to the odds at the time of writing: Clinton’s win in the first debate on Sept. 26 and the release of Trump’s “Access Hollywood” tape over the weekend of Oct. 7 to 9. Since then, we have had two more such events: the Oct. 28 release of an FBI letter announcing a reopening of the Clinton email case and a Nov. 6 FBI announcement that no new criminal charges were being considered. In this post, I will provide an update to our paper by examining market movements after the release of the letter. These movements are interesting for two reasons: 1) They provide a confirmation of the main findings of our paper, and 2) because the FBI letter was released while U.S. markets were open, we can analyze a broader range of assets and dig a bit deeper into our initial finding. Clinton’s win in the first debate increased her odds of winning the election by about 6 percentage points, from roughly 63 percent to 69 percent. Clinton’s win in the first debate increased her odds of winning the election by about 6 percentage points, from roughly 63 percent to 69 percent, as reflected in political prediction markets such as Betfair.com or Predictit.org, and summarized on David Rothschild‘s site Predictwise.com. For the uninitiated, political prediction markets are small-scale stock markets where one can buy securities that pay $1 if a certain candidate wins an election; their prices reflect real-time estimates of candidates’ odds. By Oct. 28, Clinton’s odds had risen further to 82 percent, but they dropped by about 5 points to 77 percent in the 30 to 60 minutes following the release of the FBI letter. The next two figures plot Clinton’s odds of winning and the S&P 500 futures price during the first debate and after the release of the FBI letter. For the election probabilities and the S&P 500, the second event was almost a reverse of the first. 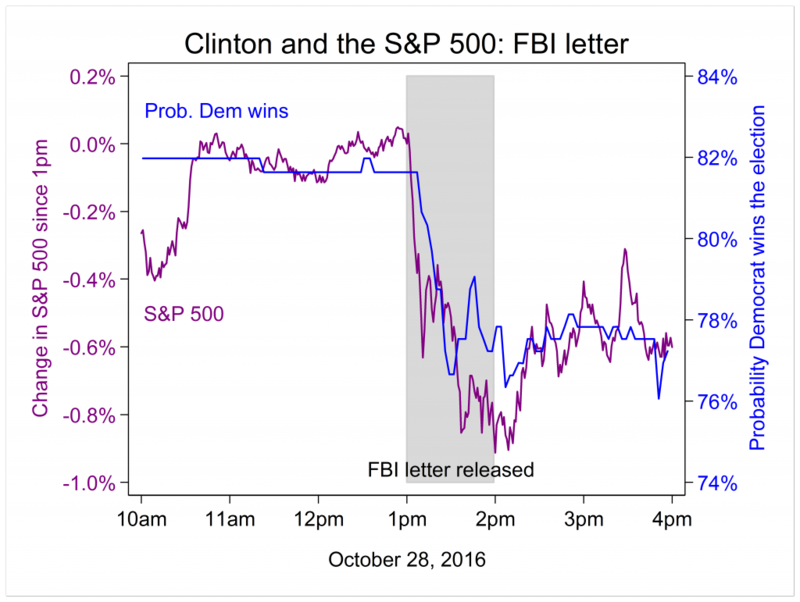 During the debate, Clinton’s win probability rose 6 percentage points and the S&P 500 rose 0.7 percent; in the hour following the FBI letter release, Clinton’s win probability fell by 5 percent and the S&P 500 declined by about 0.8 percent. For reasons we discuss in our paper, we can use the ratio of these two movements as an estimate of the market’s estimate of the effect of the election (that is, of the difference between a 0 and 100 percent probability of Clinton defeating Trump). The first debate event implies that the stock market would be about 12 percent higher under Clinton, while the FBI letter event implies a stock market that would be 16 percent higher under Clinton. These estimates are precise enough that we can be confident they are not just noise, but noisy enough that 12 percent and 16 percent should be viewed as roughly the same. This is a very large effect — with an unusual sign. In our work with Erik Snowberg on past elections from 1880 to 2004, we found that on average, the market expects stocks to be worth about 2 percent more when Republican candidates win. Magnitudes are especially modest since the start of the Cold War; to find elections that were expected to affect the stock market by 10 percent or more, one needs to look to elections contested by Franklin D. Roosevelt or William Jennings Bryan. While the parties have changed their positions on many issues, the Republicans have consistently been the party expected to be better for stockholders — until 2016. The expected effects of the election extend beyond U.S. stocks. In the table below, I compare the market movements for various assets from the debate and FBI event windows. 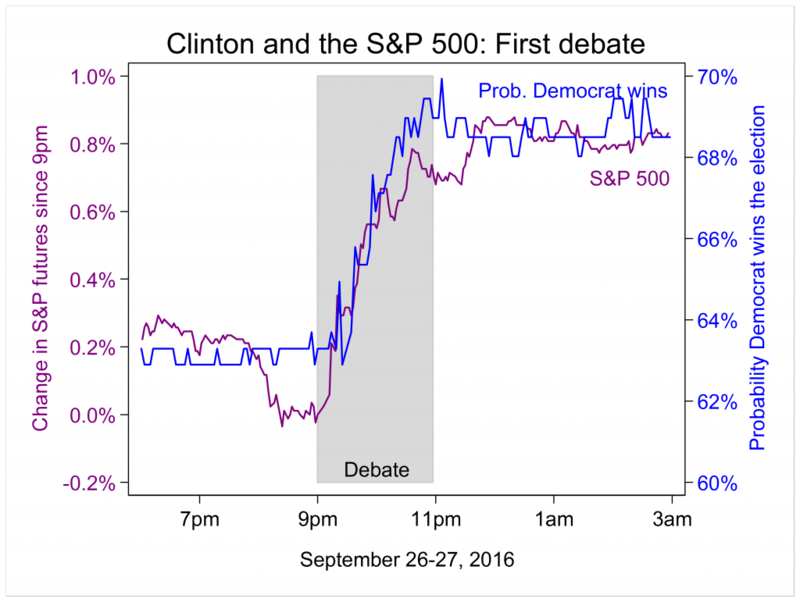 Market movements for the first debate are as reported in the paper. A few smaller currencies are omitted for space reasons. For Asian equity markets, percentage changes are from the major benchmark indices (spot values for Korea and Singapore; futures for the others) for Sept. 26 and from iShares exchange-traded funds for Oct. 28. ETF prices are converted to local currency using spot rates. Table by Eric Zitzewitz. For the most part, market movements following the FBI letter were close to exactly the reverse of those during the debate. 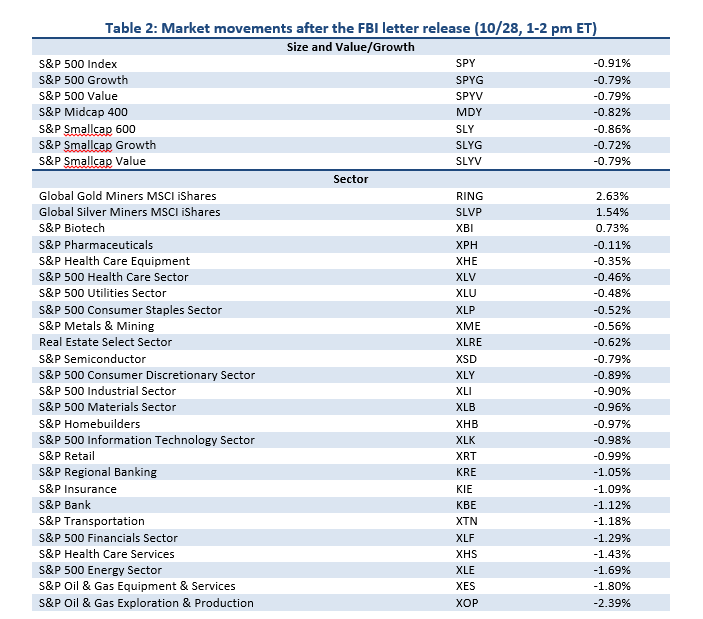 Movements in volatility futures, energy prices and precious metals were larger for the FBI event. The magnitudes of foreign currency movements for the two events are not perfectly consistent, but line up reasonably well for the most affected currencies, such as the Mexican peso, the Canadian dollar and the Japanese yen. The fact that U.S. markets were open when the FBI letter was released allows us to examine many more assets. As a small initial example, the following table reports the returns during the FBI letter window for a selection of exchange-traded funds tracking U.S. industries. The uniformity of the market movements is striking. Large and small-cap stocks and value and growth stocks basically all moved in unison. The sectors did as well, with a few notable exceptions. The market appears to expect higher gold and silver prices and lower energy prices under a President Trump, which would increase the value of firms that extract gold and silver and decrease the value of energy producers. Compared with Trump, a President Clinton would be especially good for health care services providers and less good for health care equipment and pharmaceutical makers, while biotech would actually do better under a President Trump. These movements may reflect expectations about how the Affordable Care Act, and health care policy more generally, will evolve under the two candidates. So what should we expect on election night? As of Monday afternoon before the election, Clinton was trading at about 82 percent on the political prediction markets. If we go into election night with Clinton an 82 percent favorite, our results imply that we would expect a small global stock market rally if Clinton wins (about 2 percent) and a large decline if Trump wins (about 10 percent). 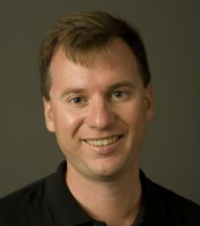 Eric Zitzewitz is a professor of economics at Dartmouth College.